« Saturday, May 15 is the Chicago Solar Schools Ride! Aside from the Solar Schools Ride, there are many great bike paths in the Chicago area just waiting for you to get your bike out on the open “road.” Aside from the crowded Lake Michigan Lakefront, Chicago has a number of bike paths in area forest preserves, on suburban streets and even along some of the main roads in the city of Chicago proper. But before you take your bike out on a long bicycle ride, it’s a good idea to tune it up! You can either take your bike into one of the area bike stores like Kozy’s, Village Cycle or Richard’s Bikes in the suburbs. Or you can Do-It-Yourself, using the simple steps outlined below. Read this excerpt from Spark People, “7 Steps to Tune Up Your Bike for Spring,” By Glenn Kent, Ph.D., Certified Personal Trainer for seven steps to tune up your bicycle this Spring. What to do: Use a basic biodegradable cleaner such as Simple Green, a towel and an old toothbrush to clean everything: the frame, chain, chain rings, cassette, derailleurs, pedals, brakes, and seat. Make an effort to use as little water as possible. Also, remove the seat post (the tube connected to your seat that slides into the frame) and after cleaning it, and add a small amount of bicycle grease before reattaching it. This grease will last longer than oil, which dries out faster, and will also act as a barrier against rust in the seat tube. Tune-up task #2: Inspect your brake system. Brakes are a vital component of all bikes because they provide control over the speed you travel. Controlling speed reduces the likelihood of being in an accident. Brakes also permit the cyclist to maneuver while turning, riding up and down hills and avoiding debris or other obstacles. What to do: First, check the brake pads, the rectangular rubberized component that actually rubs against the metal tire rim. Just like the brakes in your car, bicycle brakes wear down over time and need to be replaced. Use a flashlight to assess if the pads are wearing evenly. If you notice a ridge or other uneven wear pattern, you may need to have your brakes adjusted. Replace the pads if they show excessive wear. Next, squeeze the brake lever on your handlebars and watch the brake pads. They should hit the rim at the same time. If they don’t, you can adjust your brakes with the brake arm tension screw, which is located on one of the brake lever arms near the tire. If you notice too much slack in the cable when pulling your brakes, roll out the barrel adjuster at the end of the lever (where the cable enters the housing) to add tension to the brake cable, thereby making the brakes react more quickly. Tune-up task #3: Watch your wheels. Wheels (rims) hold your tires in place and provide stability and smoothness while riding. Your bike would not move without rims because they allow consistent contact between the tires and road surface. What to do: Clean the wheels with rubbing alcohol and a clean, dry cloth. Inspect the rims for nicks, scrapes, dents or other damage. Next, elevate one end of the bike and spin the wheel. The wheel should move smoothly, without wobbling. Repeat for the other wheel. Tune-up task #4: Inspect the drivetrain. 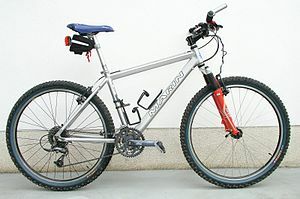 A bike’s drivetrain includes the pedals, chain, chainring, derailleur (the device that moves the chain to make riding easier or harder) and rear wheel cassette (all the little teeth in the center of the rear wheel). The drivetrain is important because it transfers the power generated by the rider’s legs to the rear wheel. This transfer of power provides the force that moves the bike. What to do: You will need a partner or bike stand to assist with this part of the tune-up. Raise the rear wheel and spin as you did when checking the wheels (task #3 above). This time, shift through all the gears. Shifting should be smooth and easy to perform. Inspect the chain, chainrings, derailleur and cassette for damage (excessive wear, missing teeth, dents, scrapes, etc.). Note that small chainrings wear out sooner than large chainrings and that chains are the most frequently replaced component of the drivetrain. If shifting is not smooth, take your bike to a repair shop to adjust the derailleur. Doing this yourself can lead to more problems if you do not know what you’re doing. Again, chains are usually the first component to go in the drivetrain and should be replaced every 2,000-3,000 miles. Replacement cost is generally between $20 and $50. Waiting too long to replace a chain will wear down the other drivetrain components faster. Tune-up task #5: Check the tires. Tires fit around the wheels (rims) to protect them and improve their function. Tires offer a source of friction (i.e., traction) with the ground, permitting travel over a variety of surfaces, including pavement, dirt and gravel. In addition, they form a flexible cushion with the ground, which smoothes out shock, making for a more comfortable ride. What to do: Check your tires for splits, cracks or tears, especially along the sides (where the tire does not touch the ground). You will also want to check the tread for uneven or excessive wear. If the brake pads were out of alignment (task #2 above), make sure they have not damaged the tires. Tune-up task #6: Check the cables. Cables are made of tightly coiled metal wire surrounded in plastic housing. Cables connect the shifters and brakes on the handlebars to the derailleur and brake pads. Cables connected to the shifters assist with moving the chain from one gear to another via the derailleur, while those connected to the brakes aid in stopping the bike when the lever on the handlebars is used. What to do: Inspect the cable and surrounding rubber housing for cracks, crimps, rust, dirt and looseness. New cables make shifting and braking smooth, which increases bike performance. If you notice damaged or worn out cables, get t hem replaced at your local bike shop. Unless you’re well-trained in this task, changing bike cables can be tricky and time-consuming. Schedule replacement of cables every 2-5 years based on use. If you ride your bike year-round, consider replacing your cables yearly. Tune-up task #7: Add lubricant. Oil lubricant coats the chain and other components of the drivetrain, helping them last longer and work more efficiently. Lube also reduces accumulation of dirt and grime, which helps increase performance of the moving parts. What to do: Apply lubricant evenly to the chain while slowly rotating the pedals in a counterclockwise direction. Also, remember to lube moving parts on the derailleur, the pivot point on the brake levers and any exposed cable wire. Remember to wipe off any excess oil with a clean, dry rag, especially on the chain. Downs, Todd. 2005. Bicycling Magazine’s Complete Guide to Bicycle Maintenance and Repair: For Road and Mountain Bikes. New York: St. Martin’s Press. Read the entire article at Spark People here. Love your post.Keep Em coming!